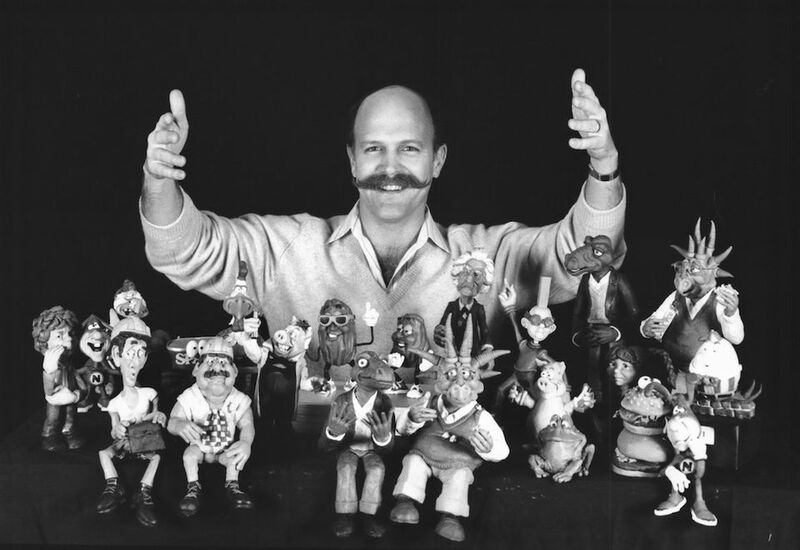 Will Vinton, his studio and body of work, was a pioneer in the art of clay animation, which he named “Claymation”. Previous to this he called it “3-Dimation”, and later in his career he would develop what he called “Foamation”. His studio inspired a new generation of clay animators and a huge public enthusiasm for 3 dimensional stop motion animation. He launched into his animation career with Closed Mondays which he made with Bob Gardner, and won on Oscar with this first film. He built a studio with stellar growth, which produced a huge amount of work every year, until he lost the studio to investors in about 2003. This was eventually rebranded as – Laika Studios. You can read the story of his career on another post, and you can buy a DVD of his work here too. Up until 1985 he made mostly short films, developing his technique and reputation for quality and innovation. After his seminal masterpiece, the feature The Adventures of Mark Twain, he made mostly commercials, TV specials and series. At the end of the post I have included part one and two of a documentary made about him and his work. These clay films are an important part of animation history, as well as being an inspiration to anyone learning how to animate in clay. These films show the best of what can be achieved in clay, so watch and be inspired, because up until the 1990’s there was no digital video assist, it’s all animated blind in a straight ahead fashion. This is what is possible with just a lump of clay, a camera and a lot of skill. Made with his college friend Bob Gardner, in the basement of Will’s house. They spent a year and a half perfecting the medium, which they had first experimented with a few years before in a short film Culture Shock which won an award at the Berkley Film Festival. Closed Mondays rekindled the interest in and possibilities of clay animation in the US which at that time had been relegated to the status of impractical and inexpressive. This film won an Oscar for best short animated film in 1975, and also the Guinness World Record for the ‘First Use of Claymation’. The success of Closed Mondays, let to funding for another short film, written and produced by Will Vinton. Animators; Bevan Vinton, Bob Gardner & Will Vinton. Featuring Kate Hendrickson. Music; Bill Scream and Paul Jameson. With a fantastic flight sequence and a powerful commentary on too much technology, this film proved that Closed Mondays was not a on off. Will has now coined the term “Claymation”, and his films are introduced as this. Also Joan Gratz has joined the team as an animator, and we can see a notable difference in the look of this film. There is more experimentation and playful use of the medium than in all the previous films. Another long short, running at 27 minutes. It was nominated for The Academy Awards for Best Animated Short in 1979. Produced and directed by Will Vinton, written by Washington Irving and Susan Shadborne (Vinton’s wife at the time and who would become his long time writing collaborator). Frank Moynihan was the executive producer. I’ll not give the full crew lists as from this point on they have grown, but the animators were; Barry Bruce, Joan Gratz, Don Merkt and Will Vinton. The techniques develop further in this film, with fantastic swirling clay used as paint. This is more of the Joan Gratz influence who was now an important collaborator with Will, on this film she is both animator and background designer. The character development is charming and subtle, but there is an amazing sequence just after the flower is first born in which the clay is used like paint to create a swirling, painterly beautiful animation. This is also a phenomenal production rate for his new studio, half hour films every year for three years running. The crew is largely the same and the previous film, and the studio now employs staff to make these short films and the commercial projects that have started coming in. This touching long form music video about poverty and loneliness at Christmas. Winning an award for Best Animation at the 15th Annual Hemisfilm International Film Festival, San Antonio, Texas, in 1981. In the same year the studio also made two other films, including the 17 minute Dinosaur and the 7 minute Legacy: A Very Short History of Natural Resources. Based on a poem by James Weldon Johnson and narrated by James Earl Jones. This film was animated by Joan C. Gratz and is a rich metamorphosing, painterly use of clay. Its clear from the style her influence in film such as The Little Prince and The Adventures of Mark Twain. Directed by Will Vinton in 1982 it was nominated for an Academy Award in 1979, as well as the Jury Recomendation at Ottawa International Animation Festival in 1982. A comedy short, animated by Barry Bruce and William Fiesterman. It was nominated for an Academy Award in 1983. Vinton studios were already in the production of their first feature film, The Adventures of Mark Twain. Considered his seminal work, here we see his clay animation technique and characterisation at its best. It received a theatrical release in 1985 limited to seven major cities. It was released on DVD in January 2006. The film features a series of vignettes extracted from several of Mark Twain’s works, built around a plot that features Twain’s attempts to keep his appointment with Halley’s Comet. Twain and three children, Tom Sawyer, Huck Finn, and Becky Thatcher, travel on an airship between various adventures. Vinton studios were nominated for an Academy Award in 1986 for Best Effects and Best Visual Effects for their work in the film Return to Oz. Here is an interview with Will Vinton on his work on this. Here is the trailer, and below a clip from the film. After the success of the California Raisins commercial in 1986 with the California Raisins singing Marvin Gaye’s “I Heard It Through the Grapevine”, Will created this 22 minute TV show featuring a variety of Raisin stories, and it was nominated for a Primetime Emmy Award in 1989. This was followed up with The California Raisin Show in 1989, and Raisins Sold Out: The California Raisins II in 1990. Here is a compilation of all the Raisins commercials. This 30 minute TV show was actually directed by Barry Bruce, and he also co-wrote it with Mark Gustafson and Ryan Holznagel. The animation team had 25 people in it, with 4 people working in art department. Will Vinton was the executive producer. It was nominated for a Primetime Emmy for Outstanding Animated Program in 1991. Directed by Mark Gustafson, and Will Vinton, and Mark also co-wrote it with by Barry Bruce and Ryan Holznagel. With a smaller animation team of 18 and a larger art department of 8. This is a beautiful looking film featuring the pig characters as in the Comedy of Horrors Show, it won a Primetime Emmy for Outstanding Animated Program in 1992. Apologies for the terrible quality of this video, it’s the only one I can find. Created by Eddie Murphy, who is also Stubbs voice, this TV series for UPN was a huge critical success, but was discontinued after just the first season. It was nominated for a Primetime Emmy for Outstanding Animated Program in 1999. For this series, and the next series in the pipeline Gary and Mike, Vinton developed a technique he called “Foamation”. This involved using a ball and socket joint armature with foam latex over that. This would enable the animation puppets to last longer for ongoing series work. The team was huge with 32 people in the art department alone, and 68 animators, not to mention the many directors, producers, sound etc. To see a little more, here is Brad Schiff’s animation showreel of his work on Gary and Mike and The PJ’s at Vinton Studios from 1998 through to 2001. This is a rare opportunity to see Gary and Mike shots, which remain unreleased. Have a look at the Cartoon Brew post on this documentary. The trailer can be seen here. Please leave a comment to say which is your favourite film! Hi this is a very nice post about Will Vinton and is a further build on previous posts about him. It’s amazing to see how he and a friend started with such humble beginnings and pioneered so much. It truly shows what can be achieved with rnough determination and hard work. Thank you so much for this great share. Thank you Kenny. Yes I have a few posts about Will Vinton. I think your comment is spot on – it’s about what can be achieved with determination and hard work. I hope it inspires people to keep working! Hello and thank you for reminding me of Will Vinton. Really enjoyed his movies and other work earlier, when I was younger. I was not famliiar with all of his work. When I saw Little Prince and Creation, this really surprised me. He is really iconic author. So many nice memories from this guy. Thank you for bringing them all up. I just watched some of his work you provided in this article. Really influential and one of a kind author. Thank you Strahinja, yes he was an amazing animator and had an amazing studio which draw in some of the most talented clay artist at the time. Sadly there is only one DVD available to buy and that is The Adventures of Mark Twain. He died just a few months ago too, I wrote a little about his life and studio here. I’m glad it brought back memories, and its also good to remember and celebrate animation heritage too. Thank you for taking the time to leave a comment!